According to RedBankGreen Kelly McRyan is trying to open ‘Boondocks II Go’ where the old Hennessey Service Station was at the foot of the Rumson-Sea Bright Bridge. Its focus will be a seafood takeout restaurant serving nearby beach clubs and pass-through traffic, much of which enters town via the bridge over the Shrewsbury River just feet away. But they’ll also have picnic tables indoors and out for onsite dining. McRyan took her idea to the Sea Bright planning board recently for advisory opinion, and came away with, well, “they pretty much said, ‘Can you open yesterday?’”. What page can Highlands take from Sea Bright? 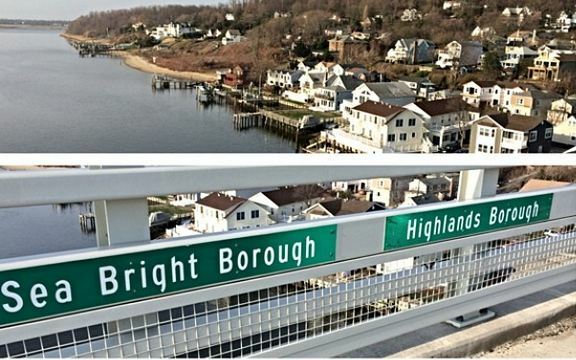 I think one could say Sea Bright was hit just as hard by Sandy as Highlands was, maybe hit even harder. And SB floods more often so that’s not it. It is likely an issue of design, aesthetics and parking where Bay Ave/downtown falls short. Bay and Shore should be made into one-ways, creating a loop with wider driving lanes and a good bike lane, barring parking on the lane side. A few ‘lesser’ buildings should be bought out , razed and pocket parking areas or small green spaces with potential for outdoor seating, installed in their place- SN has an open, greener feeling to it. Maybe try to create a greenway/bike lane down to the Bay on Cornwall, Miller or Atlantic, or similar short streets by making them one ways or taking parking away from one side. SB business area has a definite connection to its waterfront even though its mostly a parking lot on the ocean side. Red Bank has a design manual about awnings, colors, and signage and SB seems to, also. That style should be adopted here. Chain link fences, fallen-down fencing should be replaced. And Chilangos (I love it there) new “prison-cell” sidewalk addition is a huge turn-off, visually it is very uninviting- . If only Highlands had the foresight to say, ‘Can you open yesterday?’ Boondocks would have been a perfect fit for Highlands as we need more waterfront restaurants that have good food. NJview – totally agree with you re: Chilangos addition. What was Leo thinking?? I hope it comes off in the warmer months. Highlands needs to change the whole process of granting business – overhaul the mercantile license, overhaul the zoning and ordinances. The Council and HBP must change their mindset of saying “NO” into a mindset of saying “YES” to all business entrepreneurs. We don’t need to wait for a New Master Plan to take action today. Is anything happening with the space the Clam Hut was located? I would love to see another casual outside spot go up that is welcoming to boaters (a good crowd to bring into town). It lacked pretense, was inexpspenive, and was a fun laid back place. There has been talk about adding destination businesses. How about someone market M&R (that two story brown & tan office building on Bay Ave next to the Bay Ave Bakery) to a distiller, and/or cider mill? Plenty of people go to Atlantic Highlands for Carton so maybe we could have a complementary craft brewer. I wonder if it’s feasible to put the equipment on the 2nd floor or raise it up in the warehouse area to avoid the floods. The only way to find out is to market it. But the #1 question is: does our ordinance allow for that use and can the town work to streamline the approval process? We will be lucky if we manage to keep the business we have left. Now The “Sandwich Shop ” says it may fold. Doug’s got it right. If we don’t make changes fast to attract new rateables were dead esp. after the next property tax increase. There was an article yesterday that talked about Water Witch coffee shop struggling to stay open. At the risk of sounding like a broken record, I believe the new sewer line is essential to attracting business and should take priority. We proceeded with the purchase of our home after Sandy because the house was already elevated and flooding doesn’t seem to be a big issue on this end (Locust Street, next to Popomora Point). If I were a business owner I would think twice before investing on Bay Ave due to the flooding. I do hope they can expedite the sewer process asap. All the more reason that when you’re trying to decide where to go, stay in Highlands. Support your neighbors and their businesses.